This article is about the star. For the genus of raccoons, see Procyon (genus). For other uses, see Procyon (disambiguation). Procyon is the brightest object in the constellation of Canis Minor and usually the eighth-brightest star in the night sky with a visual apparent magnitude of 0.34. It has the Bayer designation α Canis Minoris, which is Latinised to Alpha Canis Minoris, and abbreviated α CMi or Alpha CMi, respectively. As determined by the European Space Agency Hipparcos astrometry satellite, this system lies at a distance of just 11.46 light-years (3.51 parsecs), and is therefore one of Earth's nearest stellar neighbours. A binary star system, Procyon consists of a white-hued main-sequence star of spectral type F5 IV–V, designated component A, in orbit with a faint white dwarf companion of spectral type DQZ, named Procyon B. The pair orbit each other with a period of 40.8 years and an eccentricity of 0.4. Procyon (top left), Betelgeuse (top right), and Sirius (bottom) form the Winter Triangle. Orion is to the right. Procyon is usually the eighth-brightest star in the night sky, culminating at midnight on January 14. It forms one of the three vertices of the Winter Triangle asterism, in combination with Sirius and Betelgeuse. The prime period for evening viewing of Procyon is in late winter in the northern hemisphere. It has a color index of 0.42, and its hue has been described as having a faint yellow tinge to it. Orbit of Procyon B seen from above its plane. Procyon is a binary star system with a bright primary component, Procyon A, having an apparent magnitude of 0.34, and a faint companion, Procyon B, at magnitude 10.7. The pair orbit each other with a period of 40.82 years along an elliptical orbit with an eccentricity of 0.407, more eccentric than Mercury's. The plane of their orbit is inclined at an angle of 31.1° to the line of sight with the Earth. The average separation of the two components is 15.0 AU, a little less than the distance between Uranus and the Sun, though the eccentric orbit carries them as close as 8.9 AU and as far as 21.0 AU. The primary has a stellar classification of F5IV–V, indicating that it is a late-stage F-type main-sequence star. Procyon A is bright for its spectral class, suggesting that it is evolving into a subgiant that has nearly fused its core hydrogen into helium, after which it will expand as the nuclear reactions move outside the core. As it continues to expand, the star will eventually swell to about 80 to 150 times its current diameter and become a red or orange color. This will probably happen within 10 to 100 million years. The effective temperature of the stellar atmosphere is an estimated 6,530 K, giving Procyon A a white hue. It is 1.5 times the solar mass (M☉), twice the solar radius (R☉), and has 7 times the Sun's luminosity (L☉). Both the core and the envelope of this star are convective; the two regions being separated by a wide radiation zone. In late June 2004, Canada's orbital MOST satellite telescope carried out a 32-day survey of Procyon A. The continuous optical monitoring was intended to confirm solar-like oscillations in its brightness observed from Earth and to permit asteroseismology. No oscillations were detected and the authors concluded that the theory of stellar oscillations may need to be reconsidered. However, others argued that the non-detection was consistent with published ground-based radial velocity observations of solar-like oscillations. Photometric measurements from the NASA Wide Field Infrared Explorer (WIRE) satellite from 1999 and 2000 showed evidence of granulation (convection near the surface of the star) and solar-like oscillations. Unlike the MOST result, the variation seen in the WIRE photometry was in agreement with radial velocity measurements from the ground. Like Sirius B, Procyon B is a white dwarf that was inferred from astrometric data long before it was observed. Its existence had been postulated by German astronomer Friedrich Bessel as early as 1844, and, although its orbital elements had been calculated by his countryman Arthur Auwers in 1862 as part of his thesis, Procyon B was not visually confirmed until 1896 when John Martin Schaeberle observed it at the predicted position using the 36-inch refractor at Lick Observatory. It is more difficult to observe from Earth than Sirius B, due to a greater apparent magnitude difference and smaller angular separation from its primary. −0.18 M☉ and it came to the end of its life some 7000119000000000000♠1.19±0.11 billion years ago, after a main-sequence lifetime of 7002680000000000000♠680±170 million years. Attempts to detect X-ray emission from Procyon with nonimaging, soft X-ray–sensitive detectors prior to 1975 failed. Extensive observations of Procyon were carried out with the Copernicus and TD-1A satellites in the late 1970s. The X-ray source associated with Procyon AB was observed on April 1, 1979, with the Einstein Observatory high-resolution imager (HRI). The HRI X-ray pointlike source location is ~4" south of Procyon A, on the edge of the 90% confidence error circle, indicating identification with Procyon A rather than Procyon B which was located about 5" north of Procyon A (about 9" from the X-ray source location). α Canis Minoris (Latinised to Alpha Canis Minoris) is the star's Bayer designation. The name Procyon comes from the Ancient Greek Προκύων (Prokyon), meaning "before the dog", since it precedes the "Dog Star" Sirius as it travels across the sky due to Earth's rotation. (Although Procyon has a greater right ascension, it also has a more northerly declination, which means it will rise above the horizon earlier than Sirius from most northerly latitudes.) In Greek mythology, Procyon is associated with Maera, a hound belonging to Erigone, daughter of Icarius of Athens. In 2016, the International Astronomical Union organized a Working Group on Star Names (WGSN) to catalog and standardize proper names for stars. The WGSN's first bulletin of July 2016 included a table of the first two batches of names approved by the WGSN; which included Procyon for the star α Canis Minoris A. The two dog stars are referred to in the most ancient literature and were venerated by the Babylonians and the Egyptians, In Babylonian mythology, Procyon was known as Nangar (the Carpenter), an aspect of Marduk, involved in constructing and organising the celestial sky. The constellations in Macedonian folklore represented agricultural items and animals, reflecting their village way of life. To them, Procyon and Sirius were Volci "the wolves", circling hungrily around Orion which depicted a plough with oxen. Rarer names are the Latin translation of Procyon, Antecanis, and the Arabic-derived names Al Shira and Elgomaisa. Medieval astrolabes of England and Western Europe used a variant of this, Algomeiza/Algomeyza. Al Shira derives from الشعرى الشامية aš-ši‘ra aš-šamiyah, "the Syrian sign" (the other sign being Sirius; "Syria" is supposedly a reference to its northern location relative to Sirius); Elgomaisa. derives from الغميصاء al-ghumaisa’ "the bleary-eyed (woman)", in contrast to العبور "the teary-eyed (woman)", which is Sirius. (See Gomeisa.) At the same time this name is synonymous with the Turkish name "Rumeysa", and it is a commonly used name in Turkey. In Chinese, 南河 (Nán Hé), meaning South River, refers to an asterism consisting of Procyon, ε Canis Minoris and β Canis Minoris. Consequently, Procyon itself is known as 南河三 (Nán Hé sān, English: the Third Star of South River.). It is part of the Vermilion Bird. The Hawaiians saw Procyon as part of an asterism Ke ka o Makali'i ("the canoe bailer of Makali'i") that helped them navigate at sea. Called Puana "blossom", it formed this asterism with Capella, Sirius, Castor, and Pollux. In Tahitian lore, Procyon was one of the pillars propping up the sky, known as Anâ-tahu'a-vahine-o-toa-te-manava ("star-the-priestess-of-brave-heart"), the pillar for elocution. The Maori knew the star as Puangahori. Procyon appears on the flag of Brazil, symbolising the state of Amazonas. The Kalapalo people of Mato Grosso state in Brazil called Procyon and Canopus Kofongo "Duck", with Castor and Pollux representing his hands. The asterism's appearance signified the coming of the rainy season and increase in food staple manioc, used at feasts to feed guests. Known as Sikuliarsiujuittuq to the Inuit, Procyon was quite significant in their astronomy and mythology. Its eponymous name means "the one who never goes onto the newly formed sea-ice", and refers to a man who stole food from his village's hunters because he was too obese to hunt on ice. He was killed by the other hunters who convinced him to go on the sea ice. Procyon received this designation because it typically appears red (though sometimes slightly greenish) as it rises during the Arctic winter; this red color was associated with Sikuliarsiujuittuq's bloody end. Were the Sun to be observed from this star system, it would appear to be a magnitude 2.55 star in the constellation Aquila with the exact opposite coordinates at right ascension 19h 39m 18.11950s, declination −05° 13′ 29.9552″. It would be as bright as β Scorpii is in our sky. 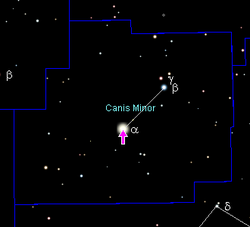 Canis Minor would obviously be missing its brightest star. Procyon's closest neighboring star is Luyten's Star, about 1.12 ly (0.34 pc) away, and the latter would appear as a visual magnitude 2.7 star in the night sky of a hypothetical planet orbiting Procyon. ^ a b Mermilliod, J.-C (1986). "Compilation of Eggen's UBV data, transformed to UBV (unpublished)". Catalogue of Eggen's UBV data. Bibcode:1986EgUBV........0M. ^ a b Giammichele, N.; Bergeron, P.; Dufour, P. (April 2012), "Know Your Neighborhood: A Detailed Model Atmosphere Analysis of Nearby White Dwarfs", The Astrophysical Journal Supplement, 199 (2): 29, arXiv:1202.5581, Bibcode:2012ApJS..199...29G, doi:10.1088/0067-0049/199/2/29 Age is for the white dwarf stage. ^ a b Schaaf 2008, p. 166. ^ Kelley, David H.; Milone, Eugene F.; Aveni, A.F. (2011). Exploring Ancient Skies: A Survey of Ancient and Cultural Astronomy. New York, New York: Springer. p. 217. ISBN 144197623X. ^ Brosch, Noah (2008). Sirius Matters. Springer. p. 46. ISBN 1-4020-8318-1. ^ Best, Elsdon (1922). Astronomical Knowledge of the Maori: Genuine and Empirical. Wellington, New Zealand: Dominion Museum. p. 33. ^ MacDonald, John (1998). The Arctic sky: Inuit astronomy, star lore, and legend. Toronto, Ontario/Iqaluit, NWT: Royal Ontario Museum/Nunavut Research Institute. pp. 72, 231–33. ISBN 9780888544278. Schaaf, Fred (2008). The Brightest Stars: Discovering the Universe through the Sky's Most Brilliant Stars. Hoboken, New Jersey: John Wiley & Sons. ISBN 978-0-471-70410-2.